Purchasing the right sod in Atlanta for your home or commercial property speaks volumes. Our sod company works with the highest quality sod farms in Georgia to provide our clients with fresh, clean, durable grass. If you are thinking about re-doing your lawn or giving a face lift to your golf course or business, contact our professional sod company in Atlanta for more details. Many customers come to us knowing what they want, but not necessarily knowing the name of the grass sod in mind. Our professionals will go over with you all the different types and help match your needs and wants with the perfect grass. Where you live in Georgia makes a big difference. Some sod types are more temperature resistant than others. Call our experts today for a free quote, and let’s get to the next stage of achieving the perfect lawn! We have been delivering high quality sod in Atlanta for 16 years now. We have gathered experience over those years working with landscapers and nurseries, and are ready to put that to work for you at your home or office. Whatever your wants or needs, we get our sod delivered by the highest quality sod farms in the state. We stand behind our commitment to quality, and anything not exceeding standards is not accepted. From home lawns and gardens, to local parks, sports fields, and golf courses, our professional sod delivery company has you covered. As a local sod supplier in Atlanta, we work with the best sod farms in Georgia. This ensures high quality grass. Our team of courteous professionals will make sure your sod is supplied promptly. They will also work through the problems that tend to come up to make sure that you are pleased at the end of the day. There is a certain simplicity that comes from being the best sod supply company in the area. It allows us to focus on the details. At the end of the day, the only thing that matters is our customers’ satisfaction and the quality of the sod we supply. Contact us today and see how pleasant and easy we can make this for you. 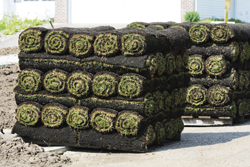 Our yard sod selection is some of the best in the area. We offer many types to meet the demands of our customers. From different textures and hues, to durability in high traffic areas, our grass sod company can deliver. All of our clients are important to us, and our customer service is ready to assist you every step of the way. We can also help tell you how to properly prepare your yard prior to delivery. Proper prep work provides optimum growing conditions for your new grass sod. Contact our office today to find out which types of yard sod in Atlanta work best in what environments and when the best planting time is. We make sure that we have an ample resource for all turf supply types. As a homeowner, when you make up your mind for the look and feel of the grass sod you want, we know you don’t want substitutions. Grass sod is a very personal choice for many clients. Many want that lush soft feel between their toes they remember as a kid. Others are looking for a heartier more durable type of grass to withstand high traffic areas. Whatever your wants or needs, we get our turf supply delivered by the highest quality sod farms in the state. We stand behind our commitment to quality, and anything not exceeding standards is not accepted. 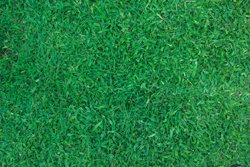 From home lawns and gardens, to local parks, sports fields, and golf courses, our professional grass sod company has you covered. Contact us today! We supply sod in Atlanta, Roswell, Alpharetta, Woodstock, Sandy Springs, Marietta and all nearby areas in Georgia.